Buenos Aires did not fail to provide another exciting race, as the third round of the season saw multiple drivers fighting for the lead in the warm Argentinian afternoon. 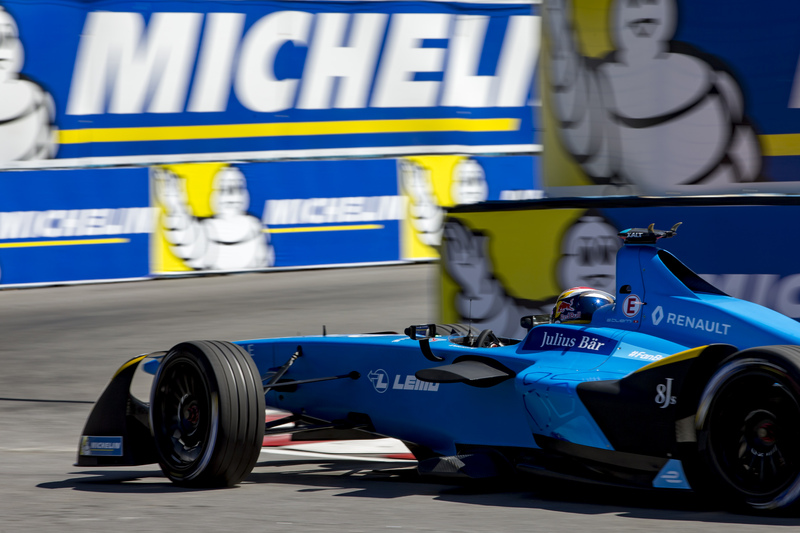 Sébastien Buemi took his third win of the season, continuing with the lead of the championship, as Vergne got second ahead of Lucas di Grassi in third. 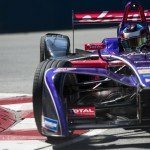 The championship leader did his first move as soon as race started, overtaking Jean-Éric Vergne and positioning himself second, behind Lucas di Grassi, who earlier in the day took his first Formula E pole position of his career. The race was then interrupted by a full course yellow as Adam Carroll failed to get off the line, with the Ulsterman managing to get his car going again before being lapped by the leaders. 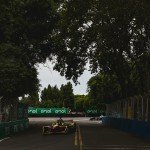 It then started to go awry for di Grassi as he fell behind Vergne and Buemi before being caught and passed by Oliver Turvey for third. Further down the field, Mitch Evans was having a stellar drive for Jaguar as he maintained a potential point scoring finish in eighth after becoming embroiled in a battle with Jerome d’Ambrosio. Before the round of pit stops Buemi managed to catch up with Vergne and challenge for the lead, ultimately taking first place away from the Frenchman. The pit stops proved to be challenging as Lucas di Grassi came under investigation for an unsafe release as he almost collected Nelson Piquet Jr on the way out of his garage, while Felix Rosenqvist, who has stayed out a lap longer, was unable to engage his second car and lost a lap while the issue was sorted. It was also a disappointing race for Sam Bird, who suffered a technical glitch in his first car and used the second to try and take the fastest lap, but ultimately fell sort as the honours went to Rosenqvist. At the front, the gap started to come down and it looked as if Vergne would be able to mount a fightback against Buemi but ran out of laps to close the margin and had to settle for second as Buemi became the first driver to win a hat trick of races in Formula E. Pole sitter di Grassi came home to collect yet another podium for his tally, although the Brazilian was visibly disappointed when he returned to the pits. 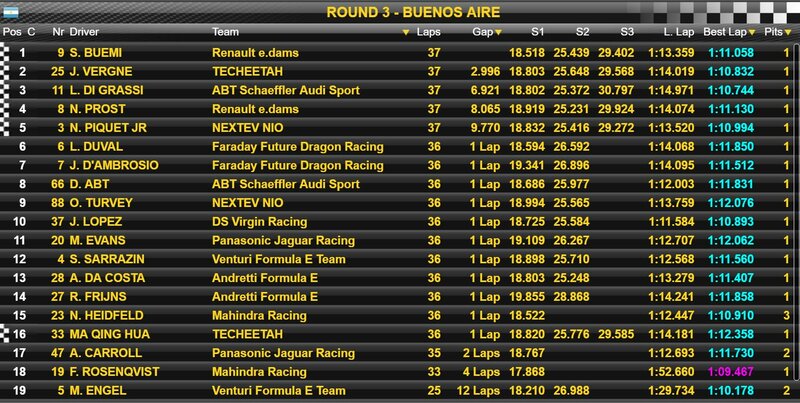 The result means Buemi continues his perfect start to the season with 75 points scored from three races, with di Grassi second in the standings on 46 points.